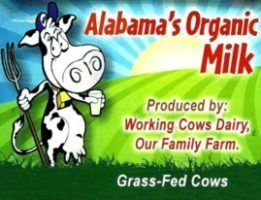 Working Cows Dairy has tested a significant percentage of their cows for A2 milk but does not have a 100% A2 milk herd. They vat pasteurize their products (at a low temperature). They write: “In 1985, we, Jan and Rinske de Jong, came to the land of opportunity with a dream to start a dairy of our own. We started “Working Cows Dairy” in October 1985. We milked 180 cows for a dairy farmer in Cottondale Florida and for that we could use his barn and 40 acres. We leased 55 cows, with the $5,000 we had saved in Holland, and started milking about 20 hours a day. In the spring of 1986 Jan planted watermelons on part of the land and had a fruit stand on Hwy 231. We stayed on this place for 2 years and left with 29 cows to a rented place in Grand-Ridge Florida. There we had three boys Jonny, Mendy, and Ike. We worked our way up from 29 cows to 220 cows four years later. We moved again to the place we are now located in June 1991. Other Labels/Standards 100 Animal Welfare Approved & American Grassfed Cert.